We rush toward the forest, following two of her Grade Two classmates. My daughter goes to Frank Hobbs Elementary School in Victoria (BC, Canada), next door to Haro Woods, which abuts an urban six-acre woodland filled with cottonwood trees and broadleaf maples, and is part of The Goward House property. Goward House is an adult activity center. Their work in the woods includes removing non-native invasive shrubs and vines, and planting local species such as camas, bunchberry, and red flowering current. “We’re going to see the Indian carving,” my daughter says. Their eyes are like dinner plates. Miracle-wide. “It’s maybe made of bones.” She says bones the way one would talk about buried treasure (but with an element of danger – as if the gold is guarded by a pirate’s ghost). I have no idea what I’m about to see. But whatever it is has instilled these 7 and 8 year-olds with a sense of wonder and amazement. We dodge the chain link fence and are out of school boundaries. We trot down a wood-chip footpath. The air smells of loamy with tinges of skunk cabbage. Sunlight spills through the leaves of maples and red alders. After our passage through an unforested blackberry field we set eyes on the objects that make us pause. There are not one but two. Three or four-feet tall. 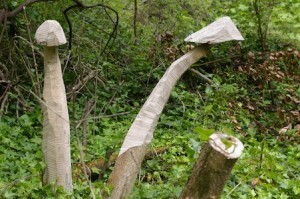 I can see they’ve been carved from the stumps of felled trees. They are mysterious. Unexpected and beautiful. Like a cat crossing your path or a sudden thundershower. And, to be fair, the sculptures are almost white as bones. What makes imaginations rev at a hundred-miles an hour? Or inspires a woodland walk instead of an afternoon of computer games? Two mushrooms. Growing where you least expect them. These carvings have helped them become awed by what surrounds them. I tried to contact the Goward House to find out the name of the artist. I’m still waiting to hear back, because I want to thank him or her for their gift.